Throughout the years of U.S. military involvement in Afghanistan and Iraq, we have seen media coverage of newly deployed and returning soldiers—the heartbreaking faces of children and spouses left at home and the joyful reunions when the soldiers return. Many military parents have experienced multiple and extended deployments over the last decade, but only recently has attention turned to the effects on the children of deployed parents. Recently published studies report that children in military families with a deployed parent are under stress, causing increases in pediatric healthcare visits for anxiety, behavioral disorders, and other mental health issues (Chandra, Lara-Cinisomo, Jaycox, et al., 2010; Chandra, Martin, Hawkins, & Richardson, 2010; Chartrand, Frank, White, & Shope, 2008; Flake, Davis, Johnson, & Middleton, 2009; Gorman, Eide, & Hisle-Gorman, 2010). Behavioral health issues of children in military families can result from the stress of having a deployed parent. Primary stressors include parental absence/separation, long-distance parenting by the deployed mother or father, challenges for the at-home parent in maintaining a household, adjusting when the parent returns from deployment, worrying about the deployed parent’s safety and fear of his or her death (often exacerbated by exposure to media coverage), and changes in the child’s role, especially older children who may assume some caregiving duties for younger siblings. Research shows that families experience increased stress when a parent is deployed, and children experience higher levels of psychosocial behavior manifestations when their parent is deployed compared with a normal population, says study author Eric M. Flake, MD, a major in the U.S. Air Force Medical Corps and chief of developmental behavioral pediatrics at Keesler Air Force Base Hospital in Biloxi, Miss. Molinda M. Chartrand, MD, a lieutenant colonel in the U.S. Air Force Medical Corps and developmental pediatrician at Spangdahlem Air Base in Germany, and colleagues found that children aged 3 to 5 with a deployed parent had higher levels of behavior problems as reported by their at-home parents and day-care providers compared with same-age children without a deployed parent. Stresses related to deployment affect families in different ways. “A deployment that occurs in a family that is resilient and well prepared, though rarely easy, can be a growing experience for all family members. However, if a family is functioning poorly before deployment for whatever reason, deployment … can in fact be the straw that breaks the camel’s back so to speak,” says Chartrand. Commander Gregory H. Gorman, MD, MHS, of the department of pediatrics at the Uniformed Services University of the Health Sciences in Bethesda, MD, and Elizabeth Hisle-Gorman, MSW, PhD, a social worker involved with deployment issues in military children, recently coauthored a study on pediatric mental and behavioral health complaints during wartime military deployment. Their study found that outpatient visits for children aged 3 to 8 for mental and behavioral health complaints rose by 11% when a parent was deployed. In other studies, the social, emotional, and academic impact of long-term parental deployment on children was evaluated. “We found that while many are coping well with deployment, some children are struggling. In our study, approximately one third reported elevated anxiety symptoms, and one third reported a moderate to high number of emotional difficulties,” says Anita Chandra, DrPH, a behavioral scientist with the RAND Corporation. Children in one study reported that it was hard to adjust to the parent’s deployment, and particularly challenging were increases in household responsibilities, time away from school activities, and stresses from helping the at-home parent during the deployment. After the deployed parent returned home, children reported challenges with reintegration, in getting to know the deployed parent again and fitting that parent back into a new home routine. Chandra’s study, which was conducted with 11- to 17-year-olds, found that older teens aged 15 to 17 experienced more challenges like these compared with younger teens. Girls also reported more stresses during parental reintegration. Families experiencing more cumulative months of deployment reported more challenges, as did families in which the nondeployed parent reported emotional difficulties, says Chandra. In another study involving teachers and counselors, Chandra and her colleagues found that while students reported doing well, school staff reported a lack of school engagement as well as behavioral issues in school, suggesting the children were not as resilient with respect to parental deployment as they thought they were. Every military base and community offers some sort of family support center that has activities for families with a deployed parent. Services include resiliency training, family advocacy, and counseling. Social workers are an integral part of family support teams, helping while the parent is deployed and then again with reintegration when the parent returns. Military OneSource, a 24/7 resource organization that is free for military families and has social workers on staff, offers counseling and other support services for families with a deployed parent. Specific resource kits, such as Talk, Listen, Connect: Deployments, Homecomings, Changes, a DVD featuring Sesame Street puppets, are available to address the unique needs of children of military parents, says Gorman. “Military and community support [such as those mentioned above] can mitigate stress,” says Flake. For children under stress, resiliency skills training to help with coping and communication are resulting in positive responses. Also, communication technologies such as Skype are helping children maintain a connection with the deployed parent, possibly contributing to better resiliency to deployment stresses, according to Flake. 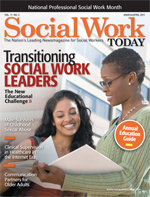 “Clinical social workers provide a large portion of the resiliency skills training and support. And for special needs families, the social worker as an invested case manager can do wonders for supporting the family,” he says. For social workers without a military background who work with military families, Chandra and Chartrand recommend learning about the military lifestyle and deployment challenges, and developing an awareness of what it means to be part of the military culture. “Since over two thirds of the medical care for military children occurs in the community of nonmilitary providers, it is important for civilian social workers who do not practice in traditional military communities, like those surrounding a base, to be aware of the unique needs of military children and to know how to access resources and best help these children,” says Gorman. • Views From the Homefront: The Experiences of Youth and Spouses From Military Families technical report: www.rand.org/pubs/technical_reports/TR913.html. Chandra, A., Lara-Cinisomo, S., Jaycox, L. H., et al. (2010). Children on the homefront: The experience of children from military families. Pediatrics, 125(1), 16-25. Chandra, A., Martin, L. T., Hawkins, S. A., & Richardson, A. (2010). The impact of parental deployment on child social and emotional functioning: Perspectives of school staff. Journal of Adolescent Health, 46(3), 218-23. Chartrand, M. M., Frank, D. A., White, L. F., & Shope, T. R. (2008). Effect of parents’ wartime deployment on the behavior of young children in military families. Archives of Pediatric and Adolescent Medicine, 162(11), 1009-1014. Gorman, G. H., Eide, M., & Hisle-Gorman, E. (2010). Wartime military deployment and increased pediatric mental and behavioral health complaints. Pediatrics, 126(6), 1058-1066.